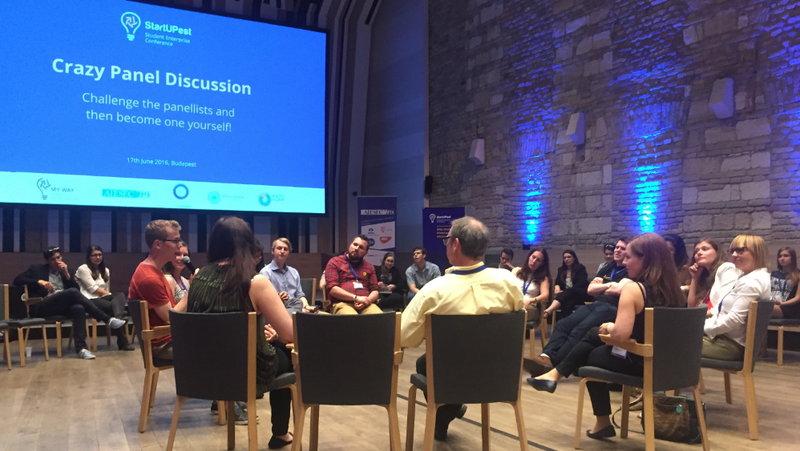 StartUPest, the second edition of MY-WAY’s Student Enterprise Conference, was organised in collaboration with AIESEC and took place at the beautiful Budapest Music Centre on the 17th of June. Students, investors, mentors and other key players of the European startup ecosystem attended the event to learn from each other and to get inspired. MY-WAY is a Startup Europe project with the goal to help more students and young adults from across Europe to become successful web entrepreneurs. AIESEC, the co-organizer of StartUPest, is the world’s largest youth-led organization. StartUPest had a clear inspirational purpose. The speakers, panelists and mentors offered their help and expertise and tried to convince the young audience to follow their passion by minimizing their fear of starting their own company. The format of the conference was pretty interactive, filled with workshops, round tables and a “Crazy Panel Discussion”. Attendees had the opportunity of presenting their ideas and projects and receive valuable feedback from experts out of different sectors. The on-stage highlights included a very inspiring speech by Rita Veres who represented the Singularity University and shared some mind-blowing predictions about the future. Another great speaker was Nick Slater from the London-based organisation Capital Enterprise. Nick gave some very useful tips on how to secure venture capital for your startup. He also advised young entrepreneurs that they shouldn’t be afraid to talk about their ideas. The more you share your idea, the more you develop/improve it. And the risk of someone copying your idea is very low. Péter Kovàcs, the co-founder of IseeQ and xLabs, shared some of his learnings throughout his entrepreneurial career. He encouraged young people not to be scared if they don’t have a perfect plan for their life/career yet. He argued that every new experience will bring new opportunities and you will learn from them all. During the event there were also a number of inspiring young Hungarian entrepreneurs who shared their startup experience, agreeing on the importance of a quality support and not being afraid of speaking up, testing new ideas at an early stage is crucial and that’s why all participants should not be afraid of speaking up and to take advantage of the opportunity to talk about their project and get as much advice as possible. A great way to get mentored as an aspiring founder is the BossConnect Mentor Programme, which was also presented during StartUPest. Veronika Pistyur from Bridge Budapest argued that “a good idea, hard work and a bit of luck is enough to realize your dreams”. Bridge Budapest is offering a fully financed fellowship program for Hungarian university students. At the end of the day there was a Crazy Panel Discussion, where all panelists and attendees shared their opinions on the topics that were discussed throughout the event. Most guest speakers agreed that in order to start your own company your idea really doesn’t have to be disruptive or game changing. Just get out there and start something. And don’t forget to talk about your idea and to get as much feedback as possible. EU-Startups.com is one of the leading startup blogs in Europe and was founded in October of 2010. We cover Internet and tech startups out of Europe and provide our readers with data-driven analysis, interviews and startup-related news. In addition to our focus on young tech companies, we also profile established firms or publish other news out of the tech-space that have a commercial or cultural impact on startups in Europe. Vision: Our vision is to connect the European startup scene and to encourage entrepreneurship within Europe. The project will enhance and improve the collaboration and efforts of web entrepreneurship initiatives (hubs, projects, accelerator networks, contests, etc. ), web/business experts (accelerators, mentors, etc. ), educational actors (business teachers and trainers) and the young adults as the final beneficiaries (through student networks, their alumni and student entrepreneurship centres). The project will create synergies and find ways to embed flexible support services based on the existing best practices to be sustained by the student centres and student networks for supporting the young adults to become web-entrepreneurs.